Everyone at one point has wanted to code their own games or programs, but not all of them have followed through with the idea. It may have been that coding seemed too hard or that it didn’t look fun enough to ever take that leap into the programmer’s world, until now. A small developing company known as ThoughtSTEM has set out to make coding fun by turning the process into a game. By coding your own spells, you will be able to move objects, create structures, and even terraform the land into what you want it to look like. What started off as a research project at the University of California in Sandiego, ThoughtSTEM ran a series of lab studies that proved that kids were able to learn code with ease all by playing a simple videogame. From there, they joined up with a team of professional game artists and programmers to make CodeSpells even more fun and easier to use. Whether you want to learn to code or use some of the cool spells to create your own landscapes and games, there is fun to be found in either aspect. Taking on one element at a time, you will be able to harness the forces of nature such as wind, fire, water, earth, and a fifth element, life. At the beginning of the game, you will have to decide which element you would like to utilize throughout the game. 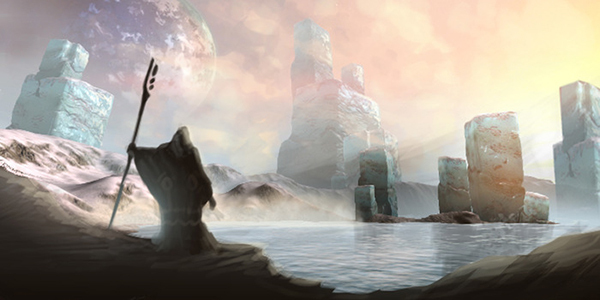 The earth element will give you control over the land, enabling you to build structures of your own design. With your rock fortress built, you can easily hide the entrance with a spell of your creation that will allow for a secret passage to reveal itself. Though having control over the land can help you build cities, it will also aid you against powerful foes, using your skills to throw boulders at your enemies as well as creating secret pitfalls in their paths. The element of fire is known to be a symbol of light and warmth that sparked life into the universe. Even with its ambiance, it can still cause destruction in its wake. Smiting your enemies with the raw power of fire might not only get rid of those who stand against you, but also cause destruction to your surroundings. Some of the terrain is highly flammable, which will cause the earth to be scorched in your path if your power is unchecked. But being the bringer of light, the spells you cast will be able to reconstruct everything from the ashes but at a high mana cost. If the area that lies ahead is scorched and yet you are being chased, you can use your elemental powers to turn yourself into ash and transport yourself to the other side leaving your enemy to stop pursuit. With the element of water, you can control all of its forms whether it’s in its solid, liquid, or gas state. This ever-changing substance will give you a lot of freedom to design you spells to contain different aspects of each state. Using the water orbs, you can redirect rivers to wash away your enemies or recreate the terrain to an oasis suited to your desires. It’s also the perfect elemental combatant against your fire counterpart, nullifying his fire spells. The water can also be used to promote growth in forests allowing for greener sceneries that the other elements might not be as well suited to accomplish. The air element is unique in that it doesn’t directly have any special attributes of its own. Instead, it amplifies the precision and effectiveness of the other elements enabling for a more destructive attack as a team. By itself, air can be used as a defensive art. With the air orbs sensing the world around you, they can influence all that they touch. You can use the spells you code to draw attention away from you by having the air transmit sounds in another direction away from you, leading creatures and players to turn their back to you. Air can also be used to stir up the other elements that surround you, allowing you to create a vortex out of sand that can blind and entrap the enemy. The fifth element of life is the most powerful element, and therefore the most difficult to master. Life magic is used to influence your surroundings as well as the creatures that inhabit the land. As the creatures come into contact with the life orbs around you, you will find that they are also made of code that you can decipher, giving you control over them. From there you will be able to alter their behavior and tame them. If you happen to come upon a creature that is defending its territory, you can cast a Life orb to study the creature, allowing for access to the ‘defending a target' function. This game is all about giving you the tools that you need to design a game that is yours as well as giving you the skills to build programs outside of the game world. CodeSpells uses real physics that is applied in every motion and spell you cast. For instance, if you are you using a spell to push a rock and it collides into another rock, that one will begin to move with it using the momentum and force of the collision. With the procedurally generated levels, every spell you cast designs a whole new world. You can invite your friends into your game to help create a game mode that harnesses all of the elements making for an experience that no one else has yet to think of. The game is currently on Kickstarter and has received more funding than what was asked and I would say that it deserves every penny it has gained. The earth element has already been created and is available as an alpha demo but the money raised from the kickstarter will allow for the creation of the elements of Fire, Air, and Water. You should expect the game to surface in its Beta form in June of 2015 with an expected release of early 2016 for PC, Linux and Mac. The spells you create are only limited by your imagination, so think of something amazing.